One RCT focused on coordinating medical services for persons with dementia. Callahan et al. 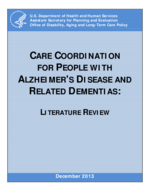 (2006) described a 12-month collaborative care coordination program in Indiana for persons with dementia which based care recommendations on published Alzheimer's disease treatment guidelines in the United States. Guidelines referenced included those from the American Academy of Neurology (1994); a U.S. Department of Health and Human Services (HHS) panel published in 1996; a VA publication from 1997; and a consensus statement of the American Association for Geriatric Psychiatry, the Alzheimer's Association, and the American Geriatrics Society published in 1997. The collaborative care model, which has been suggested as a way to improve the management of chronic illnesses, is generally distinguished by a team-based approach involving collaboration among providers, patients, and caregivers. In this intervention, the team was led by a primary care physician and a geriatric nurse practitioner, who served as the main care coordinator. Participants with possible or probable Alzheimer's disease were recruited. Approximately half of participants were from economically disadvantaged backgrounds and had multiple comorbidities. The study outcomes included cognition, activities of daily living (ADLs), and nursing home placement.